Eren Yeager's tribunal before Commander-in-Chief Darius Zackly certainly could have gone better. Options as varied as dissection, martyrdom and public exectuion are bandied about, to the horror of Eren and his friends. Thankfully, a few people think that Eren might be of some use. Will the Levi, as a representative of the Survey Corps, be able to convince everyone that Eren should be allowed to live? Now that the dust has settled after the breach of the south gate of Trost, it's time for the newly graduated trainees to choose what branch of the military to join. 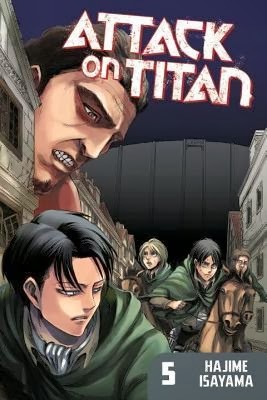 Usually, trainees would never have even seen a Titan when they decide what their career path will be, but these soldiers have already seen battle. How will the Survey Corps, with on a 10% four-year survival rate, manage to attract any of these new graduates, at a time when they're needed more than ever? On Eren's first expedition with the Survey Corps' Special Operations Squad, he's under the direct command of Levi and his elite squad. As the mission and its and formations are shown to him, he begins to wonder what exactly the goals of the expedition are. Will Eren learn to be a proper soldier and trust his commanders? Isayama has raised the act of releasing just a tiny bit of information at a time to an art form. The reader gleans little bits of the backstory as it becomes relevant, but never feels strung along or cheated out of information that he should already know. As the intrigue only grows deeper, and whatever's in the basement of Eren's familial home becomes more important, we'll follow our heroes and discover the secret of the Titans with them. Highs: As we meet the members of the Survey Corps, perhaps Eren and Mikasa aren't the most damaged members of the military after all. Lows: Isayama has had a method to his madness so far, but the extra chapter about Ilse Langnar is just enough information to be cruel. Verdict: Another high-quality entry in one of the best manga series in years.